*69 contains neon green and pink glitters in a various shapes and sizes with a pink shimmery clear base. Shown is 1 coat over 2 coats of Elevation Polish Whoops Jungfrau with top coat. I love anything bright and with added stars and pink shimmer, how could you say no! It makes me a little sad this was a "flash sale" and everyone couldn't get their hands on this because it's so much fun! Here is 1 coat of *69 over 2 coats of Up in Smoke with top coat. 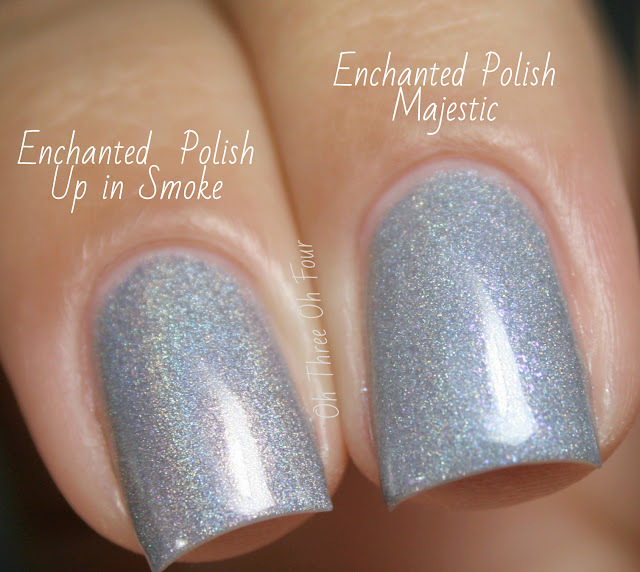 Up in Smoke is a dusty purple/gray holographic. All nails are 2 coats with no top coat. As I mentioned, *69 was a "flash sale" therefore it may or may not return. Sorry! Follow Enchanted Polish on Facebook, Twitter and Instagram or sign up for her newsletter, for information on restocks and new colors. Up in Smoke is an exclusive shade for Mei Mei's Signature. It is supposed to return soon so make sure to follow Mei Mei's Signature on Facebook, Twitter and Instagram!